My BFF is not feeling very well so I wanted to drop her a card in the mail today. super sweet card. Hope she gets well soon. Thanks sweetie. I hope so too, She has been sick for several days. Supposed to go to Dr. today. What an adorable card!! !Love it!Sooo Sweet! Oh so cute!!! I love the embossing on the inside sentiment! Oh my gosh! This is so darn cute! 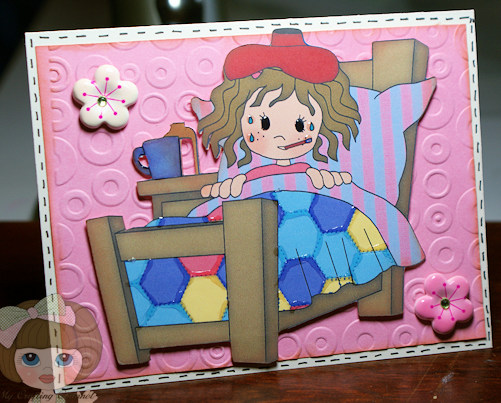 I love the color combinations that you used and the embossing! Just great! Thank you so much for the candy & card! It really brightened my day. I am hanging your card up in my scrapbook room, every time I see it, I will think of you! Thank you Chriss. I'm happy our pkg arrived and that you like your card. This is so super cute!! Love the colors! This will definitely brighten her day! Thanks Susie.. I sure hope so I miss my BFF. Cute image on the front and I love the textured words on the inside! Your get well card is so cute. Have a great day! Aaah, how cute. This should cheer your friend right up! 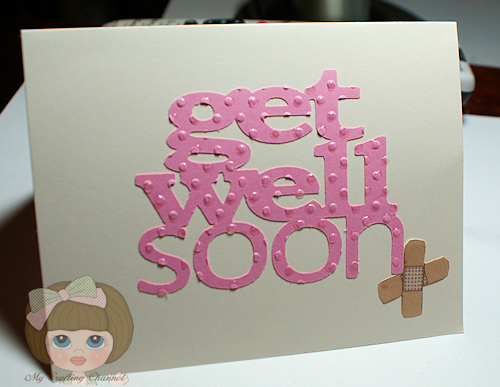 I know that she will feel better the minute she gets that FAB card...I did when I received your beautiful Get well card! Thanks again.. I am positive this made her feel better! This is absolutely adorable! Put a smile right on my face! You are so sweet. Thanks Tammie. Oh what a great bff you are. Your card is sweet and it should make anyone feel better. Thanks for sharing, God bless. Thanks. It did she received it today and loved it.